Another Concept Sale, another Question & Answer session. Since last Friday, we’ve been collecting questions from the dedicated Q&A post here and today our designers working on the ship will answer 10 questions for the community. Tune back in this Friday to see the answers to 10 more questions. Special thanks to Calix Reneau and Steven Kam for taking the time to answer these questions for us. Will the Prowlers “Grav Levs” allow it to act similar to a dragonfly, turning it into a “ground” vehicle of sorts? As noted in the literature that accompanies the Prowler’s IAE posting, “the Prowler’s Grav-Lev plates give additional flight control when traversing along uneven surfaces. This comes quite in handy when trying to position the Prowler alongside a large capital ship or inside a planetary fortification.” While, like the Dragonfly, the Prowler is not strictly a ground vehicle, the Grav-Lev plates allow for a similar mode of traversing planetary or very large surfaces. They also improve the Prowler’s maneuverability while interacting with the surface, adding their net impulse to the ship’s standard maneuvering thrusters. In effect, this gives the ship slightly better “traction” than when maneuvering free in space or atmosphere. 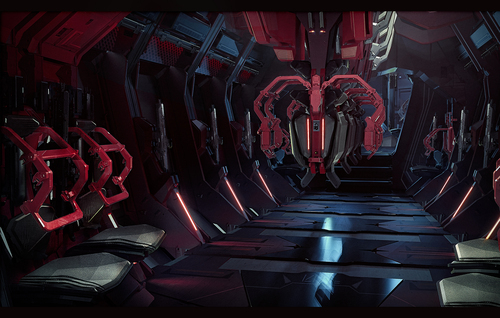 The Prowler in the lore is described having amazing and unrivaled stealth capabilities. Can we expect the reproduction from Esperia to be just as good? Does the reproduction differ performance wise in any way? Esperia is committed to living up to the legends, and the Prowler’s remarkable stealth was one of its strongest assets during the various conflicts between the Tevarin and the UPE. In general, Esperia is motivated to maintain the “experience of the ship” when deciding whether to apply a technical update to the ship (read the brochure page, “A Break from Convention” for some background on Esperia’s philosophy regarding reproductions in general). Part of Esperia’s work necessarily means adapting alien ships for human use to some degree, as you may remember from seeing Esperia’s Glaive reproduction. For the Glaive, the cockpit’s ergonomics were adjusted and a human-compatible (although still quite alien) avionics suite were installed. The Prowler is similar; fittings and ergonomics were adjusted to suit human operators and many of the avionics and some materials were updated to match current technical standards of efficiency and safety; remember that at the time of the Tevarin conflicts, in many ways the Tevarin were not as technologically advanced as the UPE. We haven’t completely determined whether or not there will be literally zero difference between the “original” Prowler and the Esperia Prowler in performance due to these updates and adaptations; it’s entirely possible that present-day equipment standards result in some very slight differences or deviations in signature, durability, or other factors, but they’re as likely to work in your favor as not, all in very minor ways. Why would someone buy the Prowler over a Redeemer or Hoplite? The Prowler is built for stealth deployment and emergency extraction – if you’re going in quiet or coming out loud, the Prowler is an excellent choice. But just as with any other area where there are a variety of ships that can serve a certain role, each has its strengths and weaknesses and what you’ll favor may depend on your play style, particular skills, and overall strategy with your fellow players, if any. It’s just a cool ship, for one thing. The Prowler definitely gets style points. For another, it’s a very dedicated personnel carrier that carries quite a lot of troops for its size compared to the Redeemer or Hoplite. And further, the Prowler, due to its Grav-Lev plates has a handling edge when it comes to getting through that last part of the landing approach, including fast landing and positioning, as well as hugging terrain features for cover from enemy defensive emplacements, which can be a significant advantage in a tight situation. On the flip side, the Redeemer and Hoplite are designs that more heavily incorporate considerations for direct ship-to-ship combat, being a gunship and fighter, respectively. While the Prowler does sport some pretty solid weaponry, as many fighter jocks will tell you, firepower is only one of the variables in ship-to-ship combat. What you’ll want depends greatly on how you like to play – as well as what the opposition has arrayed against you. The sales page says the Prowler is fast. How will it compare to other ships such as the Vanguard, Redeemer or Cutlass. The Prowler has a unique flight style relative to its fellow troop carriers, using low acceleration rates with a high SCM cap to stay stealthy, and boosting for exceptional acceleration when stealth is no longer the concern. So it is both faster and slower than those ships listed depending on what kind of speed you’re talking about. Be judicious with that boost though – the Prowler holds a fair amount of fuel, but it’s powerful boost nevertheless consumes fuel far more quickly than its intakes will regenerate. Will the Prowler have enough modularity for other roles or is it solely used for dropping/boarding? 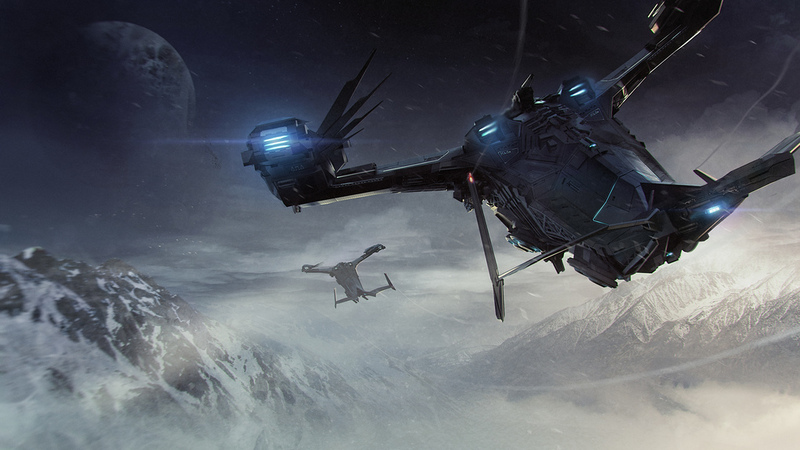 Like all Star Citizen ships, the Prowler is intended to offer plenty of customization options through configurable hardpoints and options relating to different types of equipment, including avionics, thrusters, power plants, and weapons. That said, the Tevarin designed it as a dedicated armored personnel carrier/dropship first and foremost, and as such many of its core and integral features, from its airshielded deployment portals to its Grav-Lev plates are designed to help it excel in that role. Some ships are very modular, while others are much more specialized, and you can already see that in the range and variety of ships previously introduced. Players are a creative lot, however, and we hope and expect that you will find creative uses for your ships that defy convention and occasionally wisdom. What type of travel range will the Prowler be capable of? The Prowler is a short-range craft, more akin to a landing craft than a long-range transport (in contemporary terms, think of a beach invasion). It’s meant for assaults and boarding, not long-duration or long-distance patrol. Like many ships, it can be fitted with a jump drive and is capable of quantum travel, so it’s got longer legs than a snub fighter or Argo of course, but you should think of the Prowler as a short-range ship, developed originally by the Tevarin to operate with military fleet support, as many small military ships are (like most fighters). Will the Prowler have room/racks to store extra weapons, ammo and explosives for the boarders? Absolutely, the Prowler is a dedicated armored personnel carrier and boarding ship. It’s understood that in many cases the troops may need different equipment loadouts depending on the job and the Prowler can carry plenty of troops, so there is some space for additional infantry gear on board, to expand your options or ammo supply. How powerful are the scanners/sensors on the Prowler? Can the top weapons turret be replaced with a scanning array similar to the Vanguard Sentinel, Cutlass Red, or Hornet Tracker? The top turret mount is piped for power and weapons, but not sophisticated scanners and datalines. Remember that the Prowler design hails from a period in history where the UPE and Tevarin were in conflict, and at that time, the UPE was technologically superior to the Tevarin in many ways. While the Tevarin had some unique and interesting shield tech, they lagged behind the UPE in others, and raw avionics power was one of them. Additionally, Tevarin use of Prowlers was focused on the taking of objectives identified by other ships and operatives in the fleet, and powerful (and potentially noisy) scanning arrays that could interfere with its stealth were rejected in favor of providing more space for troops, their equipment, improved stealth features, and effective Grav-Lev plates. Can players use weapons, like the sniper rifle, while the personal doors are open? Indeed they can. The Prowler is an unusually effective and specialized dropship and combat personnel carrier for many reasons, and that’s one of them. Utilizing the back-ramp, is it possible to fit a Dragonfly inside of the Prowler? This is not yet fully determined, but we’d advise against expecting it. The interior of the Prowler is still subject to further implementation and the Prowler’s first design priority is carrying troops. It’s not a cargo ship, so it doesn’t have cargo-style locking plates, and the troop deck is not a hangar, so even if a Dragonfly could sit physically on the Prowler’s troop bay, this would not be a very practical or safe way of transporting one. Ich bin immer noch fasziniert wie viele verschiedene Schiffstypen es mittlerweile gibt. Frage mich langsam, ob die Komplexität von Star Citizen nicht erschlagend wird. Tja CIG hat erkannt, dass bis in die letzte Schraube designte Schiffe, die Brieftaschen flattern lässt . Ich muss zugeben das mich die Prowler hier auch total anspricht, allerdings wüsste ich nicht viel mit einem Dropship anzufangen . Viele Schiffe steigern die Komplexität aber wohl kaum, ausser wenn man dann mal beim Schiffshändler steht ^^. Ist wohl eher etwas für Clans bzw. Organisationen. Vielleicht sollten wir eine WASD.ms Organisation gründen.